I know that the title of the film is Tea and Sympathy. It is one of the few films that I have seen. I have a weakness for films about schools. "Goodbye Mr. Chips" is one of my favourites. Actually one of my regrets in life (along with never having dated Robert Redford) is never having studied Latin at University - I know there is no comparison. I'll leave that for another post. Anyway. I love Debbie New's teacups and here they are. I empathized with them immediately. They are the kind of knitting project that you either like or don't. 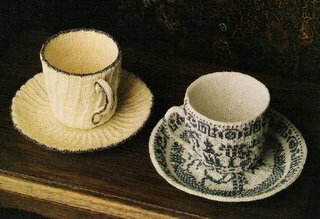 When trying to sell the kits to stores, shop owners would often say - but who would want to knit a tea cup? - indeed, who would want to go to the moon ? Well, over the years, a number of people have knit them. They were knit as gifts for teacup collectors, for Mother's day, for mothers to give to daughters and the occasional son as keepsakes. Some knit them for the challenge of knitting something new and different. Others knit them because they were there. 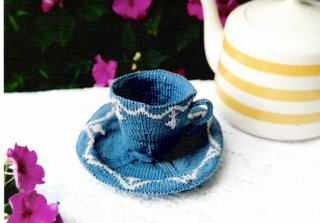 I knit them for the fun of trying to translate a treasured teacup pattern into knitting. 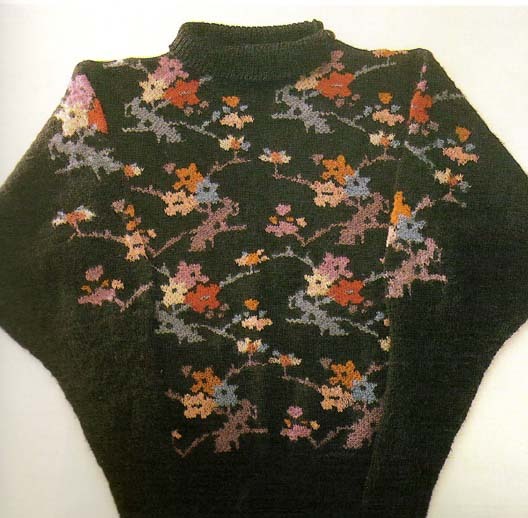 I suppose I could have just knit a sweater, the way Sasha Kagan did. I'll have that picture soon and the name of the book. But I wanted to get inside the form too. To me there is something sublime in the picture of the knitted teacups. There is a peace, a serenity that is made even more poignant by the introduction of the element of knitting. There is form and order in the tidy room. 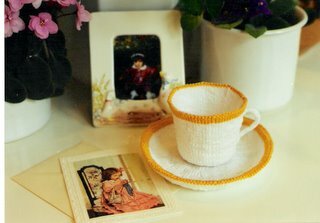 There are memories of cups of tea with relatives, perhaps relatives that knit. There is warmth and comfort and security. I send this card to someone who has experienced a tragedy or is in need of some comfort. It reminds me that there is an enduring structure to life and that things will fall into place again and life will go on. I was, as a teenager, a teacup collector. I don't collect them anymore - I have to dust now - I didn't then, neither did my mother, come to think of it, - there wasn't a lot of form and order in my mother's house - but there was a lot of "creative" mess!! Here are some of my attempts at trying to translate teacup patterns in porcelain, into perle cotton. This was fun. Thank you, Debbie, for pushing me on! Now where is that boat pattern?